Sony may have given Marvel Studios the right to use Spider-Man in the Marvel Cinematic Universe, a seemingly very good decision for everyone involved, but that doesn't mean the studio is getting out of the comic book movie game. They are going to make use of the other Spider-Man characters they have, starting with an R-rated Venom movie that will star Tom Hardy in the lead role. Now we have word that the studio is plowing forward with the first of several Spidey spin-off movies, as Venom is reportedly going to be starting production in September. 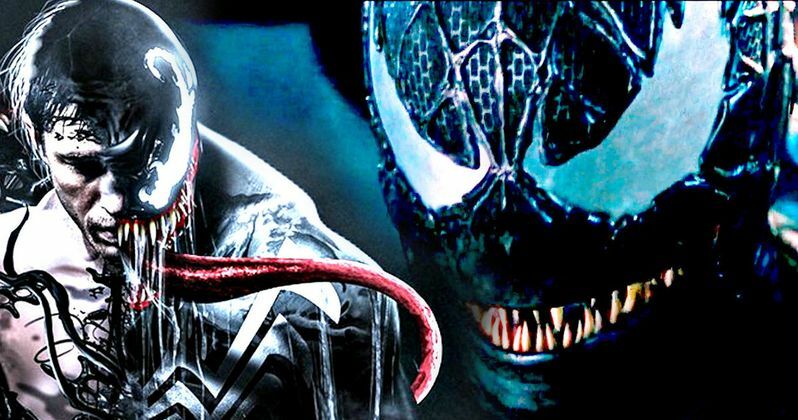 According to Omega Underground, Sony will start shooting Venom on September 1 in both Atlanta, Georgia and New York City. Since the movie is currently slated to hit theaters on October 5, 2018, that timetable seems to make a lot of sense. There is no word yet on how long production is expected to last, but shoots for these kinds of movies often last several months, leaving plenty of time for post-production and reshoots, if need be. In rare cases, movies like Avengers: Infinity War, which are truly massive in scale, will have much longer shoots, but this probably isn't going to be one of those cases. Especially since Tom Hardy is quite the busy dude. A lot of productions have been shooting in Atlanta Lately. Marvel Studios has been shooting a ton of movies there, such as a very good chunk of Spider-Man: Homecoming, which also shot in New York City as well, since that is where the webslinger resides. Venom, aka Eddie Brock, also calls NYC his home, which would explain why they will be shooting there, but it also presents some potential issues. How are they going to explain why Spider-Man is nowhere to be found if the Venom movie takes place in New York City? Will they even bother? Fans will surely want some kind of explanation. Granted, the general public may not care all that much, but it is a pretty glaring elephant in the room that will need to be addressed. In addition to Venom, which is going to be directed by Ruben Fleischer (Zombieland), Sony is also working on a Black Cat and Silver Sable movie. There is no word on a release date for that, or what other characters may be looking at getting their own movies, but Sony is planning on making use of what Marvel characters they have and is creating their own universe of movies, currently called Sony's Marvel Universe. It has been reiterated by both sides several times that these movies and characters will not crossover with the MCU, which presents all kinds of questions and, given Sony's track record with superhero movies over the last ten years, might make fans nervous. As much as people may feel trepidation about a Venom movie that won't feature Spider-Man, there are reasons to feel good about this. For one, Tom Hardy is one of the best actors working today and he chooses his projects carefully. The fact that he signed on for this is a big deal. Also, even if the movie winds up tanking, it won't affect anything over in the MCU, so there's really nothing to lose from the fan's perspective. Only some money for Sony to possibly lose.